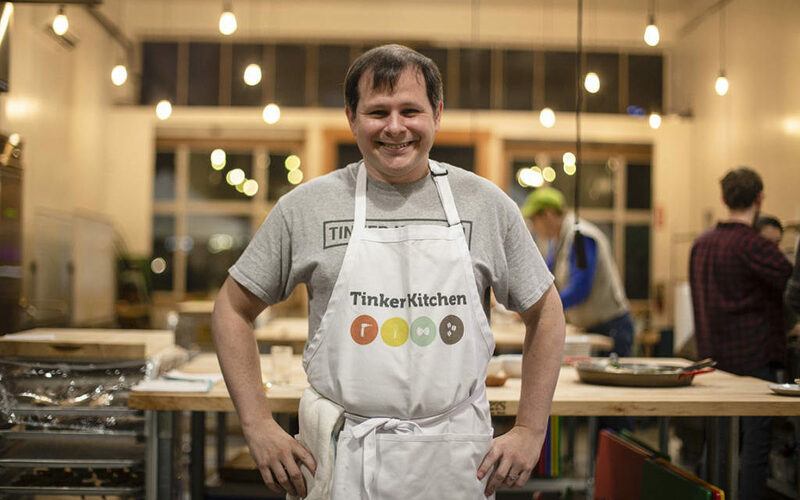 Dan Mills, founder of Tinker Kitchen. Photo by Abraham Rodriguez. At one point in time, Dan Mills just couldn’t fit his toys in a room anymore. A computer scientist with cooking ambitions on the side, Mills’ kitchen started expanding to the living room of his one-bedroom apartment. It started with a pasta extruder, but the collection of gadgets soon took over every available space. Venezuelan born and raised, he had grown acquainted with cooking as a community experience. “I wanted to go back to that experience of a social space, cooking with friends for friends, and taking it outside of your very tiny kitchen,” he said. So he decided to share his toys. This was the reasoning behind Tinker Kitchen, the new makerspace for food hobbyists just off of Mission on 22nd Street. In a city of cramped spaces and tight budgets, Mills hopes to provide cooking aficionados with a space to nerd out around expensive cooking gear, and share the pleasure of doing so. Equipped with shiny ovens and long mobile tables, the 1,700-square-foot kitchen has machines as technical as a Pacojet ice cream-maker, as homely as a carbonation rig, and as artisanal as a coffee roaster. Whether the experiment turns out to be a Pinterest fail or a wonder worthy of Chef’s Table depends on the craft of the dabbler. Fouad Matin, member of Tinker Kitchen, prepares dessert for the open house visitors. Photo by Liliana Michelena. The business, born out of a Kickstarter campaign, has a hundred members rotating in and out of the kitchen, which is open Wednesday to Monday from 10 a.m. to 9 p.m. Tinker Kitchen charges members $150 a month for drop-in access. There are also one-day passes for $35. Open-house night had a handful of members and Mills himself working on so-far-unnamed orange creamsicles, roasted chicken with olives and centrifuged gummy bears, which resembled bubbly, crunchy, colored candy. Busy on the weekends and more solitary during weekdays, Tinker Kitchen will also bring in more professional types to give classes. 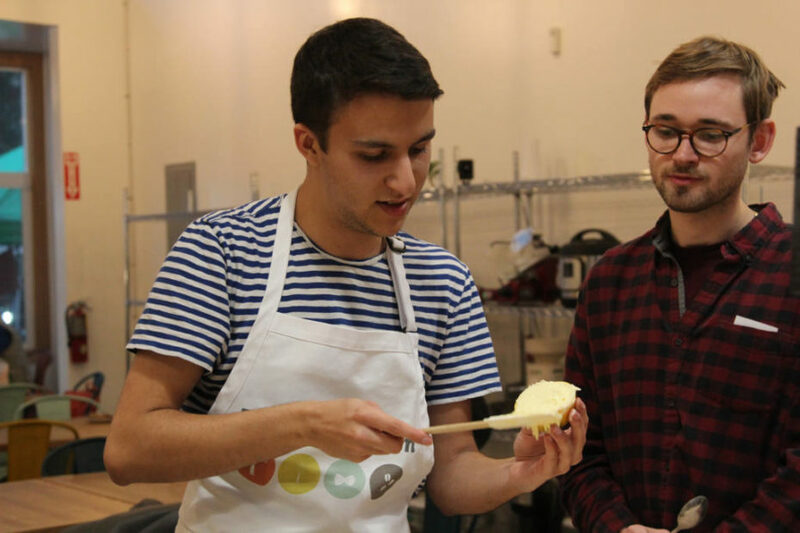 Mills, for example, will be teaching sous vide, and is considering a Venezuelan arepas class. “We are a business, but we don’t want this to be an exclusive place,” he added. Still shiny and smelling brand new, Tinker Kitchen awaits new members and curious types wanting to get their hands dirty at 3233 22nd Street. Dishwasher on site. PreviousWhat happens when you throw away e-cigarettes?